Life without the EcoSmart 27 could leave you taking a cold shower! You see, tank-style water heaters have a limited amount of hot water, but a tankless heater, such as the EcoSmart Eco 27 can deliver an endless stream of piping hot water. Even after your family has showered and you've run a load or two of washing, you'll still be able to enjoy a hot bath. 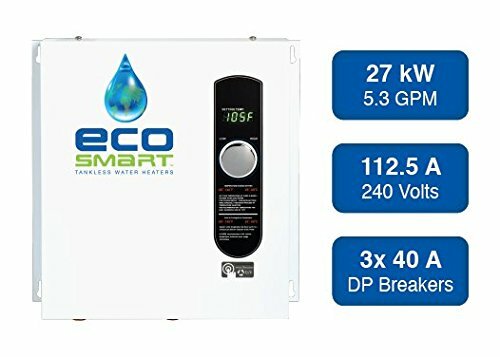 Tankless water heaters have a lot of advantages, and the Eco 27 is no exception, in fact, for the price, it's hard to beat . . . but we're getting ahead of ourselves. A typical tank-style hot water heater is designed to hold about 30 to 50 gallons of water, which is then heated to a pleasantly warm temperature using either gas or electricity. Constant energy is needed to keep the water within the tank hot and ready for use. When hot water is drawn from the tank, cold water is added so it can be heated. During periods of high usage, a tank can easily be depleted of hot water. When this happens, you'll need to wait for the water to heat before it can be used again. The Eco 27 Tankless Water Heater doesn't store hot water, and therefore, does not have the need to keep it warm. Instead, it only uses electricity when there's a need for hot water. When a hot water faucet opens, the Eco 27 immediately switches on its burner to quickly heat the cool incoming water as it runs through a heat exchanger. As the heated water leaves the tankless heater, it'll soon be delivered to the open hot water tap. Because tankless water heaters only turn on when needed, they are often called an on-demand water heater. When properly sized, they're capable of delivering an unlimited supply of hot water to your family. Space Saving - The Eco 27 uses a fraction of the space that a tank-style water heater requires. Money Saving - Since the Eco 27 only switches on when you need hot water, there's no wasted electricity to keep the hot water warm when it's held within a tank. Self Regulating - This model regulates itself, so only the correct amount of energy is used based on the amount of hot water you need. Energy Efficient - With a 99.8% energy efficiency rating, the Eco 27 can save up to 50% savings over your traditional water heating costs. Endless Hot Water Supply - When sized properly, the Eco 27 offers hot water that never runs out, no matter how long you shower. No longer will each family member need to take quick showers just so the next person has hot water! No Recovery Time - An endless hot water supply means you'll always have hot water. You won't need to wait before the hot water heater recovers to wash dishes or take a bath. Price of Fuel - Electricity is generally more expensive than natural gas. So the reliance on electricity makes the Eco 27 more expensive to use than a tankless water heater that runs on gas. Professional Installation Required - Although, it's always a best practice to have tankless water heaters professionally installed, in order to validate the lifetime warranty, the Eco 27 must be installed by a professional. Measuring in at only 17” high by 17” wide by 3.6” deep the Eco 27 is mounted on the wall and can free up to 12 cubic feet of space that the typical tank-style hot water heater requires. Leaving you extra room for storage or simply additional floor space. Electric tankless water heaters are designed to be installed indoors, and although they do require a substantioal amount of electricty to operate, they do not need the expensive venting that an indoor gas tankless requires. Electric tankless water heaters allow for a more flexible installation location. For example, if you have a multi-story home, a tank-style hot water heater will likely be installed in the basement due to its bulk. However, you can install this tankless water heater on the second floor where it'll be nearer the showers and be better able to heat their water. You’ll need to call in a professional to ensure that your electrical system can handle the following: 27 kilowatts, 13 amps, 3 x 40 amp double-pole breakers, 112.5 amps of maximum power, and an amperage draw of 113 amps. The Eco 27 can deliver 6.6 gallons of hot water per minute (GPM) at its peak performance. But in most situations, due to the cooler incoming water temperature, you can expect 3.0 GPM, which is capable of heating 2 showers at the same time. The temperature can be conveniently adjusted in 1-degree Fahrenheit increments using the dial and digital display. Internal jumpers limit the heat output to a maximum of 105-degrees F. Thus preventing a scalding hot bath. This safety feature is especially helpful for households which includes elderly individuals and children. In areas where the incoming water temperatures can drop to 37 degrees Fahrenheit, the Eco 27 is capable of heating up to 3 gallons per minute (GPM). This should accommodate up to 2 of your family members showering at the same time without ever running out of hot water. Many other tankless water heaters cannot function properly in such cold climates. In southern climates, the unit can deliver up to 6 gallons per minute, delivering enough hot water for 4 showers and a sink to run at the same time. 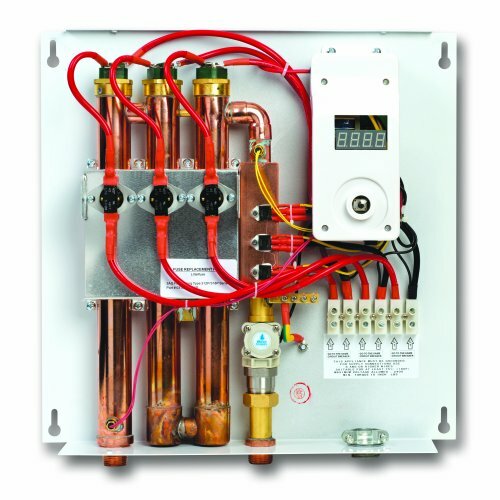 Sizing your tankless water heater is critically important. Where you live will play a big role in the amount of hot water the unit can deliver. Be sure to consult with your installers to ensure that the model works well with your climate and intended use. In areas such as North Dakota, Minnesota, Alaska, and Wisconsin, when the incoming water temperature is 37 degrees F. you can anticipate it'll deliver 2.7 gallons of hot water per minute. But in warmer climates, such as Hawaii, parts of Florida and Puerto Rico your likely to get 6.6 gallons per minute because the incoming water temperature is 77 degrees F.
Designed with patented self-modulating technology, the Eco 27 is capable of regulating the exact amount of energy needed to heat the required hot water. This feature will save you money since nearly all of the energy needed (99.8%) is used in heating the water. Although installation requires the services of a professional, maintenance is easy enough to perform by yourself. A screwdriver is all you'll need to keep your Eco 27 in working order, making maintenance inexpensive and convenient. The EcoSmart Eco 27 is competitively priced and no more expensive than a large tank-style water heater. The industry leading lifetime warranty adds significant value to your purchase. If you are installing the Eco 27 into a new home or replacing a tankless water heater, the job and cost should be pretty straight forward. However, in an existing home, a tank-to-tankless installation can be both costly and time-consuming. The unit will need to be professionally installed shortly after it is purchased in order to validate the warranty. But if you take the time to make sure everything is in order, the Eco 27 is covered by a lifetime warranty should any part break down and need repair. However, the company does not provide a warranty for labor, so you’ll need to budget for the cost of a plumber or electrician. 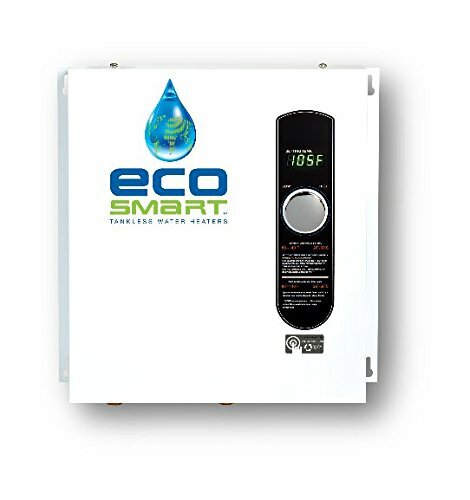 The EcoSmart 27 Tankless Water Heater can be the answer to your water-heating woes. Its advanced technology and compact design deliver unlimited hot water that will also save you money on your energy bills. Keep in mind, that the unit may only prove to be cost-effective for existing tankless installations, new construction, or an older home where you’re going to stay long enough to recoup the expense of installation. If you’re planning on moving from your home soon, the expense of switching from tank-to-tankless may not be cost effective. 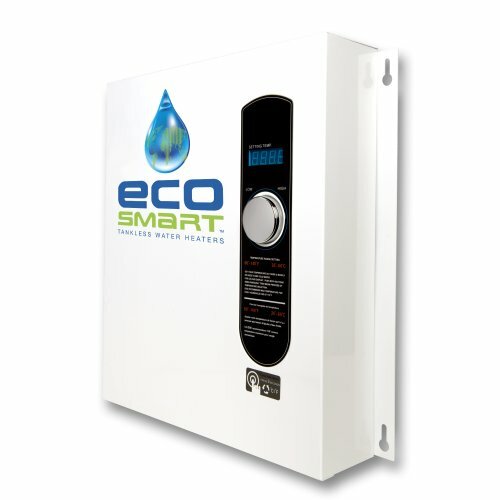 If the unit’s capabilities do not seem adequate for your climate or water use, the manufacturer, EcoSmart, offers a more powerful unit called the Eco 36. Because of its 36 kilowatts, it can manage up to 4 showers and 2 sinks, or 3.6 GPM for inlet temperatures of 37 degrees, or 8.8 GPM for inlet temperatures of up to 77 degrees F.
Conversely, if your hot water needs are lower or you only need on-demand heating for one fixture, the manufacturer also produces less powerful devices. At the point of use, the POU 3.5 uses only 3.5 kilowatts, making it ideal for a single sink application, such as in a powder room, wet bar, or craft area. This device delivers a minimum of 0.4 GPM with inlet temperatures of 37 degrees or up to 0.9 GPM for inlet temperatures of 77 degrees F.